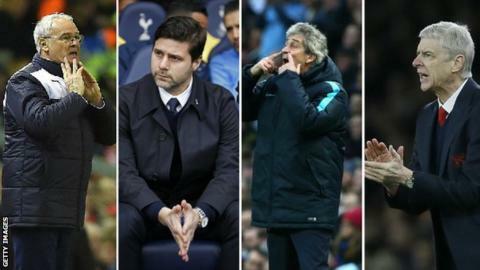 Premier League title: Arsenal, Man City, Leicester or Tottenham? Premier League titles are not won in December as the saying goes, and in this topsy-turvy season, picking England's next champions five months early is an even trickier task. Can Leicester do the unthinkable? Will this finally be Arsenal's year? At this stage last year, 13 points separated the top four, a gap which stands at just four points this season. So who will break from the pack? BBC sport's chief football writer Phil McNulty (PM) gives us his verdict with the help of BBC Radio 5 live pundit Steve Claridge (SC). PM: Arsenal have the creative brilliance of Mesut Ozil and goals from the attackers of the calibre of Olivier Giroud and Alexis Sanchez. A crucial new factor is the vastly experienced Petr Cech in goal - not just a calming influence and world-class goalkeeper, but also a personality who knows what it takes to win Premier Leagues at Chelsea. SC: Arsenal's weaknesses are they have too many players in one position and not enough width and balance in their team. Defensively they can be suspect when they haven't got the ball so they can be vulnerable when they don't dominate the ball. PM: Mental fragility. Have not yet provided conclusive evidence that they have conquered this block - and suspicions that flaw remains were raised again by the shocking 4-0 loss at Southampton on Boxing Day. Arsenal also suffer too many injuries. What manager Arsene Wenger says: "In 2015, if you look back and try to analyse, we have been consistent and overall we had quite a positive year. We have stabilised defensively and improved our record against the strong teams in the Premier League. So it looks like we are on the right trend, the right way." PM: Goals and brilliance in the shape of Jamie Vardy and Riyad Mahrez. Desire and intensity all over the pitch and an outstanding midfield player in N'Golo Kante. Atmosphere at the King Power Stadium is also a huge driving force. PM: Shallow depth of squad and it would be a devastating blow if either Vardy or Mahrez were to suffer any injury that would sideline them for a lengthy period of time. The size of their squad may also be examined by the intense pressing style employed by manager Claudio Ranieri and epitomised by Vardy, Mahrez and Kante. May run out of steam. SC: It's probably a danger for them to think 'we've got a chance'. All of a sudden they are thinking they have something to lose for the first time and it's changed slightly. It was blasé and now they have something tangible to hold on to. All of a sudden then there's a little bit of pressure. What manager Claudio Ranieri says: "Every match is difficult for us. This league is very crazy...nobody wants to win the league. It's very strange. We're the basement and the other teams are a villa with a swimming pool. It's not easy for us but we want to fight with everybody. It's a miracle what we're doing. I'd love this to continue but it's not easy." PM: World-class players in key positions, such as David Silva and Kevin de Bruyne in and around an attack that contains the brilliant Sergio Aguero. City have the Premier League's deepest, best squad and the ability to beat any team on any given day. PM: Key players such as Aguero and Vincent Kompany spend too much time troubled by injury and for a side of such brilliance they can often produce mystifyingly lack-lustre and uninspired performances. Poor away form also letting them down. SC: It's a bit of a bits and pieces team. Central defence and up front their two main players are obviously not fit and they cannot replace them in their side. What manager Manuel Pellegrini says: "We are three points behind the leaders and play them both at home in the second half of the season. The season for the moment is good. We know we must improve. "I think we conceded 20 goals in the first half of the season which is too much." PM: A young, vibrant squad under the guidance of an outstanding young manager in Mauricio Pochettino who now has Spurs playing the intense pressing game he demands. They have a regular source of goals in Harry Kane also a shining star is emerging in Dele Alli. PM: Will the goals still come if Kane gets injured? And will they have the squad and the mental strength to cope if expectations rise further and they actually get close to that first title since 1961? They may - but it is an unknown quantity. SC: Spurs have been the most consistent in my view. When I saw them they lacked balance and width at home but they are tough to play against. They might just get away with Harry Kane. If he gets injured, can they replace him? What manager Mauricio Pochettino says: "I think the numbers reflect that the title is always possible. You need to show the strength during the whole season, we start to speak today about the title, but it is still most important to work hard."